These quilts have fun written all over them! 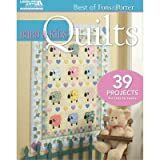 Whether Baby is a girl or boy, you’ll find the ideal quilt in these adorable designs ranging from “Sweet Rosebuds” to “Big Boy Blue.” Choose from nine delightfully versatile patterns. Use lots of bright colors, choose delicate hues, or feature novelty prints–and always have exactly the right gift.